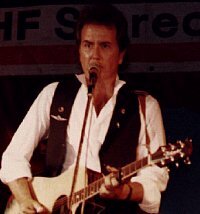 John Stewart was an American singer/songwriter, born in San Diego, California on 5 September 1939 and whose career spanned over 40 years. I discovered John in the summer of 1974 (I was 19 at the time). My stepdad had a decorating business in Liverpool and asked me to work for him, during the college vacation, delivering supplies in a Bedford pick-up truck. Since the truck had no radio, I used to keep a battery-operated radio/cassette player on the passenger seat. One day, I decided to go to the local record shop (or store if you are American) to browse the albums. (CDs hadn't been discovered then). Once in the truck, I turned on the radio to the local station. The song they were playing was "July, You're A Woman"; I was totally knocked out. "Who is this? ", I thought. At first, I thought it was Johnny Cash (whom I really admire) but the voice wasn't as earthy and the backing wasn't familiar. Unfortunately, when the song came to an end they went straight into a news bulletin and didn't say who the singer was. I was furious. I couldn't believe it when I arrived at the record shop (sorry, store) and they were playing the same song. "Who is that singing?" I asked the assistant. "Some guy called John Stewart", replied the assistant; "the boss is really into him." He showed me the album sleeve and it was the Phoenix Concerts double album. "I'll take it," I said, payed him the money and left. That summer I listened to nothing but this album and used to sing the songs from it whilst driving around in the truck. Since then I have bought any John Stewart recordings I have been able to lay my hands on and have been to a number of his gigs here in UK - he is still my favourite. Anyway, I won't bore you any more with my ramblings, except to say that this page is a tribute to a great singer/songwriter and will always be under construction. Please feel free to email me if you have any information, news, views, comments or criticism. Oh, and afore ye go, please don't forget to sign the guestbook. This Folk Music Web Ring site is owned by Bob Elliot.